^ Orchard, Anthony E. (ed.). 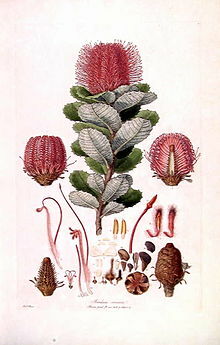 Proteaceae. Flora of Australia, Volume 16: Elaeagnaceae, Proteaceae 1. Melbourne: Australian Biological Resources Study / CSIRO Publishing. ^ Mast, A. R. and Givnish, T. J. Historical Biogeography and the Origin of Stomatal Distributions in Banksia & Dryandra (Proteaceae) Based on Their cpDNA Phylogeny. American Journal of Botany. 2002, 89 (8): 1311–1323. ISSN 0002-9122.